Panelists answered graduate students’ questions during the first-ever C3-LADO visit to University of Michigan. The first-ever C3-LADO visit to the University of Michigan generated a lot of interest on campus, with nearly 60 graduate students and postdocs participating in the two-day event on October 10 and 11, 2016. Mark Kamimura-Jimenez, Assistant Dean of Programs, Policy, and Diversity Initiatives at Michigan, welcomed visiting faculty and Michigan graduate students and postdocs. Day one began with a panel on academic life at liberal arts colleges, moderated by Kathryn Low (Bates College). Panelists Matt Carter (Williams College), VaNatta Ford (Williams College), and Adriana Salerno (Bates College) discussed topics such as student performance, cross-departmental collaboration, funding, and teaching loads. In her keynote address, Susan Douglas, Catherine Neafie Kellogg Professor and Arthur F. Thurnau Professor at the University of Michigan, discussed her personal experience teaching and conducting research at both a liberal arts college and a R1 university. Dr. Douglas also incorporated discussion of her award-winning work on gender and feminism. The day ended with discipline-specific workshops, in which liberal arts faculty met separately with Humanities, Social Science, and STEM graduate students and postdocs at the Michigan Union. The following day, students and postdocs met individually with seven liberal arts faculty members, who provided constructive feedback on their cover letters and CVs. The visit concluded with a well-attended lunch panel of faculty members from Connecticut and Williams Colleges who openly discussed social and intellectual life at liberal arts colleges. 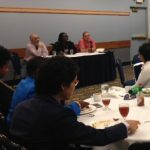 Rhon Manigault-Bryant (Williams), Ronald Flores (Connecticut), and Christopher Goh (Williams) answered questions about student-teacher relationships, community integration, and the maintenance of professional and personal boundaries.